Tswreis Entrance test hall tickets for Inter with Integrated Coaching 2018-2019 TSWREIS Entrance test Hall tickets. Tswreis Entrance test hall tickets, TSWREIS Admission into 1st Year Intermediate with Integrated Coaching for IIT-JEE / EAMCET / NEET / CA-CPT 2018-19 Hall Ticket / Acknowledgement Download. TSWREIS Long term NEET 2018-19 Telangana NEET free coaching Online Application form, TS Social Welfare Residential Schools Long term NEET 2018 Free Coaching Admissions 2018 Application Form, TSWREIS NEET Free Coaching Selection list/ Merit list @ tswreis.telangana.gov.in. 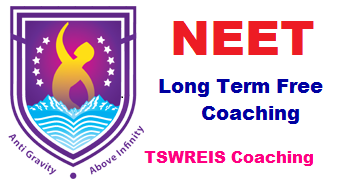 TSWREIS NEET Free Coaching 2018 Online Applications Apply at tswreis.telangana.gov.in. TS Social welfare Residential are invited from Boys and Girls for admissions into Long term coaching for NEET at TSWRS/ JC (G), Gowlidoddi, Ranga Reddy District for the academic year 2018-2019. Long term NEET 2018 Free Coaching Admissions 2018 TS Social Welfare National MBBS Admission Online Application Form and Selection list, who are eligible Students Apply Online for Medical Long term coaching for NEET Admission 2018-19. TSWREIS NEET Long Term Free Coaching for EAMCET-II Online Application at www.tswreis.telangana.gov.in. Only students, who belong to SC community, can apply. Only the students who have passed IPE in March 2018 are eligible. The applicant should have minimum 90% in IPE to apply. The applicant must have secured below 30,000 ranks in EAMCET-II-2018. Note : SC candidates who have secured ranks below 30000 in TS EAMCET - II conducted recently can apply online only through society website. The applicant should submit his/her application through on-line our website : www.tswreis.telangana.gov.in before or on 05-01-2018. TSWRS/JC (G), Gowlidoddi, Ranga Reddy District. Last date for submission of application through on-line is 07.01.2018. Selected candidates will be informed through SMS on 0.0.2018. Classes will commence from 0.0.2018. TSWREIS Inter With integrated coaching for IIT-JEE/EAMCET/NEET/CA-CPT/CLAT- 2018-19 TSWREIS Admission into Long term NEET 2018 Free Coaching Hall tickets, Results, Selection list, Merit list at tswreis.telangana.gov.in.